Y.CO tell me that the 27m motor yacht Bembik, a joint listing with SuperyYachtsMonaco, is now sold with Yacht Moments in Mallorca bringing the buyer. 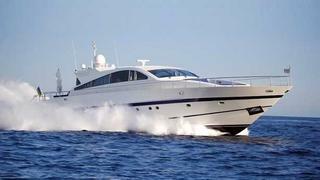 A high speed motor yacht in Arno’s Leopard 27 series, built in 2006, Bembik tops 41 knots when her twin MTU 16V2000 engines are at full throttle, and cruises at a no less impressive 38 knots. The yacht, which has had a successful charter record, sleeps seven guests in three cabins – an extremely spacious master, a double and a twin with a Pullman berth. Bembik was asking €1.25 million.